Find out where your landscaping career will blossom. 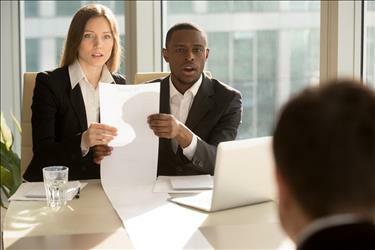 For professionals who are looking to launch their landscaping careers, location can be just as important as training or education. 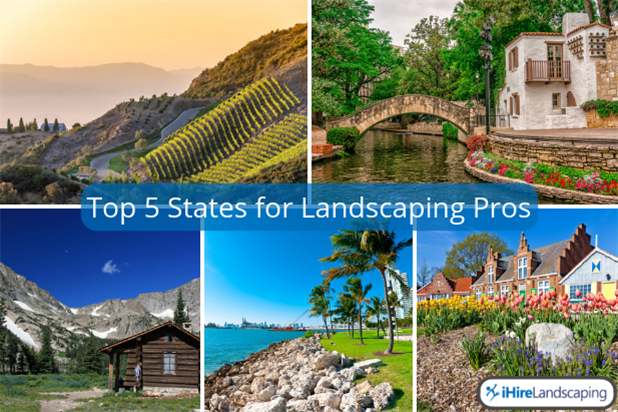 To find out what state has the most landscaping jobs, we looked at the iHireLandscaping job database of 12K+ opportunities. Our results may surprise you. Whether you’re looking for seasonal landscaping jobs in the United States or year-round opportunities, you should start by looking for landscape jobs in these locations. The green industry in California contributes 0.83% of the state’s gross domestic product (GDP), with $25B in sales and nearly 260K jobs according to the California Landscape Contractors Association (CLCA). With subdivisions full of well-manicured lawns, acres of vineyards, and some of the most famous national parks in the US, California is a great state for young professionals to begin their landscaping careers. 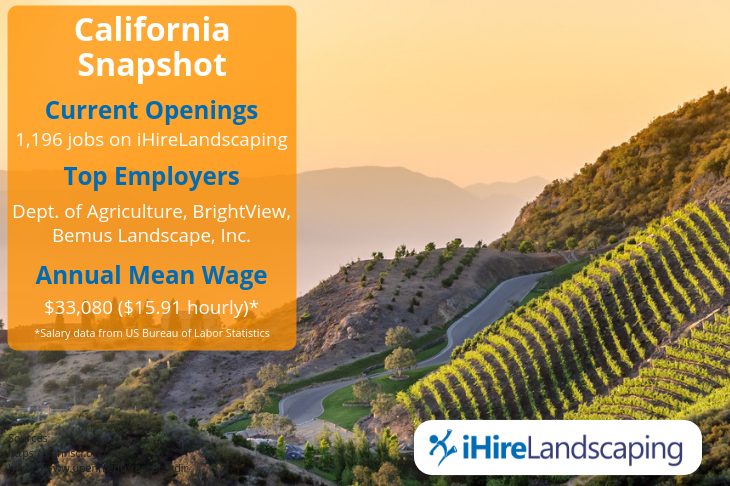 At the moment, there are almost 1,200 landscaping jobs in California open on iHireLandscaping. The Dept. of Agriculture has the most landscape jobs and is followed closely by BrightView and Bemus Landscape, Inc. The environmental horticulture industry in Florida generates more than $21B in total revenue and employs approximately 232K people according to the Florida Nursery, Growers, and Landscape Association (FNGLA). That’s enough to put the Sunshine State at number two on our list of the best states for landscaping pros. 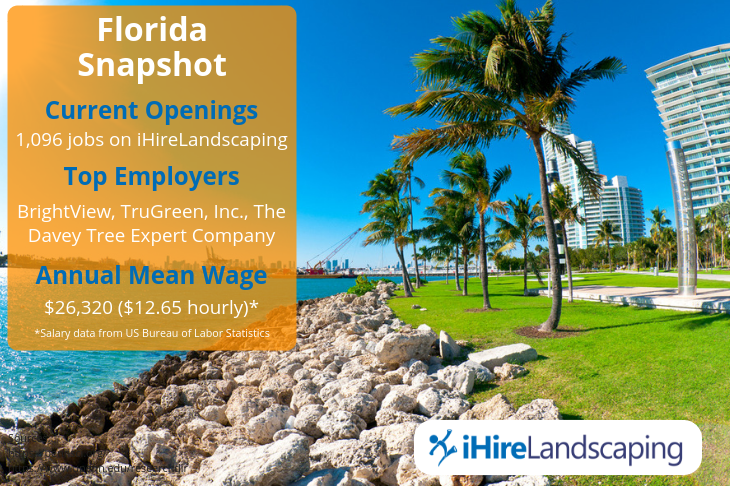 Landscaping jobs in Florida are plentiful on iHireLandscaping, with nearly 1,100 openings currently available from major employers including BrightView, TruGreen, Inc., and The Davey Tree Expert Company. A recent report from the Texas Nursery and Landscape Association (TNLA) found that nursery and landscape businesses contribute almost $19B to the Texas economy and employ nearly 210K workers. You’ll find more opportunity in the eastern half of the Lone Star State, especially in and around large cities like Austin, Dallas, and Houston. 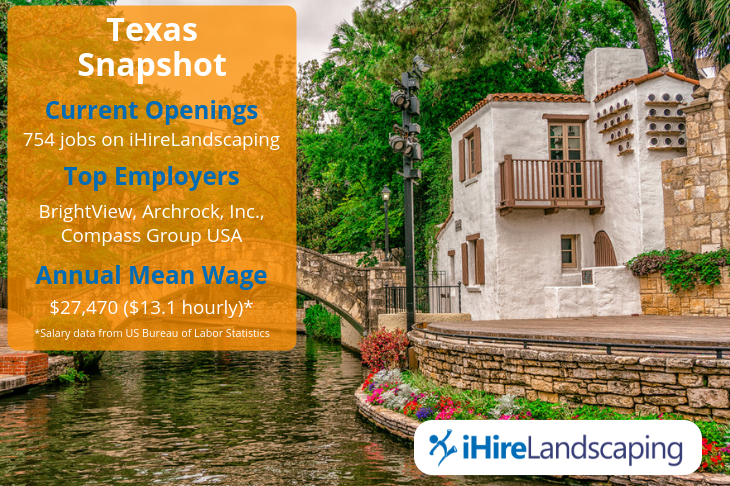 iHireLandscaping currently has 754 landscaping jobs in Texas available from many large employers including BrightView, Archrock, Inc., and Compass Group USA. 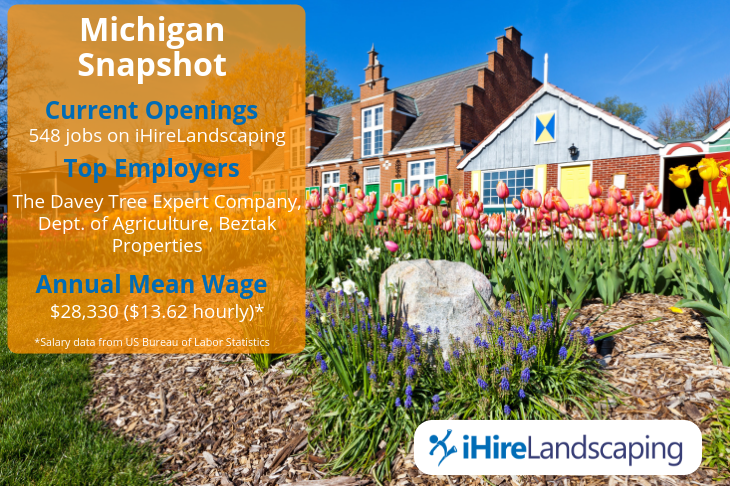 If you’re surprised to see Michigan on a list of the top states for landscape jobs, you shouldn’t be. It’s the fourth largest state in the nation for nursery sales, generates $5.7B in total sales, and boasts more than 36K professionals working in the green industry according to the Michigan Nursery and Landscape Association (MNLA). Right now on iHireLandscaping, you’ll find more than 500 available landscaping jobs in Michigan from employers such as The Davey Tree Expert Company, the Dept. of Agriculture, and Beztak Properties. Mention Colorado and most people probably think of the Rocky Mountains and their fabulous ski slopes, but the state also has a thriving green industry that has grown by 24% since 2011 (and more than 90% since 1999) according to a 2017 report by Colorado State University. The Associated Landscape Contractors of Colorado (ALCC) trade organization represents the 43K+ green industry workers who contribute more than $2.8B to Colorado’s economy each year. 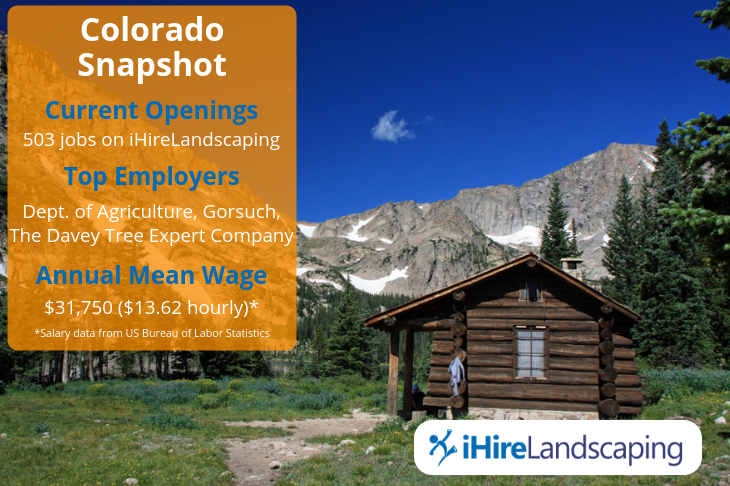 On iHireLandscaping, you’ll find 500+ landscaping jobs in Colorado at the moment, and the top employers are the Dept. of Agriculture, Gorsuch, and The Davey Tree Expert Company. Search for landscaping jobs in the United States or your local area on iHireLandscaping and find postings for Landscape Designer, Supervisor/Foreman, Groundskeeper, and Laborer openings as well as other great landscaping careers. *Number of current openings as of 10/1/2018.